Two 415-metre production lengths of niobium-tin (Nb3Sn) conductor for the toroidal field coils were loaded on 25 June for delivery to the European winding facility in La Spezia, Italy. The superconductors for the ITER magnet system are among the longest-lead production items for the project; the first five Procurement Arrangements concluded by the ITER Organization between late 2007 and mid-2008 concerned the conductors for the toroidal field magnet system. The Russian Domestic Agency is responsible for 20 percent of toroidal field conductor procurement and 14 percent of poloidal field conductor procurement. Production is ongoing according to the schedule of the Procurement Arrangements. 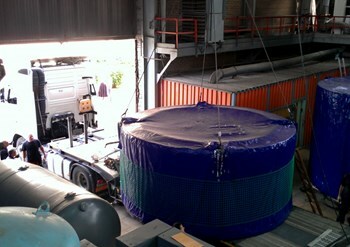 On 25 June, the second batch of toroidal field conductor unit lengths started on their way from the premises of the Kurchatov Institute in Moscow to the city of La Spezia, Italy, where the winding of ten toroidal field coils will take place. Demonstrating the attachment of Russian industry to fulfill its contractual obligations on time, two 415-metre production lengths of niobium-tin (Nb3Sn) conductor for toroidal field side double-pancakes were loaded onto trucks at the Institute. This latest shipment follows the delivery of four conductor unit lengths to Europe in October 2012, including a copper dummy and a 100-metre qualification length. Seven similar units lengths have passed all of the tests stipulated in the Procurement Arrangement and meet ITER Organization requirements; they will, in turn, be shipped as well.